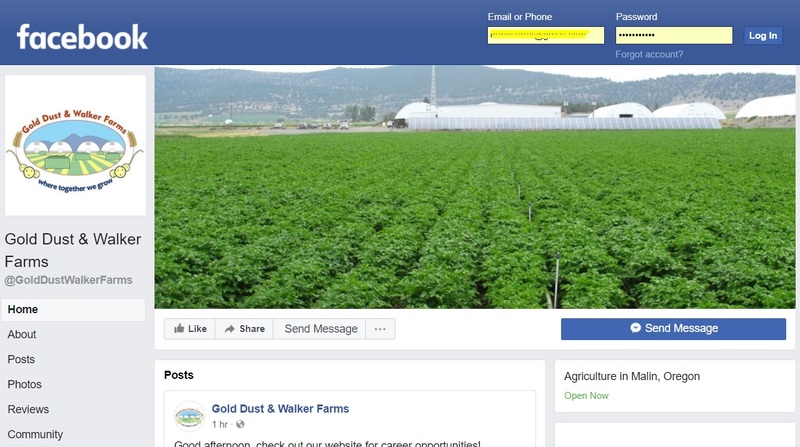 You are here: Home / Gold Dust Potato Processors / Check Us Out On Facebook! It finally happened – we set up a Facebook page! What should you expect to see on the Gold Dust and Walker Farms Facebook page? A little bit of everything. We initially set it up to showcase the various job opportunities we have available on the farm, in the shed and in our offices. However, that’s not all you’ll find. From what’s going on in the fields and on our campus to some of our favorite aspects of farming and agriculture, we plan on sharing those and hope you will do the same. When you have a few minutes, we hope you’ll take some time to see what we’ve put up so far. And if you see something you like, please feel free to give it a like and share it with your friends in your feed (especially if you know someone that would be perfect for one of our job openings!). And if you want to stay up to date with out latest posts, be sure to like and follow our page. We hope this will give our community some insights to how we operate and what we feel is important. For example, one of the most amazing things about farming in the Klamath Basin is the sheer amount of wildlife we get to see on a regular basis. One morning in late February, Tricia and her family were driving around the farm and came across a flooded field that full of swans trumpeting and feeding on the leftover grain in the bottom of the open water. We feel blessed that we’re able to live in an area where we can experience that, and so, it ended up as one of our posts. Again, we hope you enjoy our page and that you will follow us. And we also hope it gives our followers a better understanding in why we enjoy farming in the Basin so much.